We’ve been stuck inside a lot this winter, with yucky weather and yucky colds. 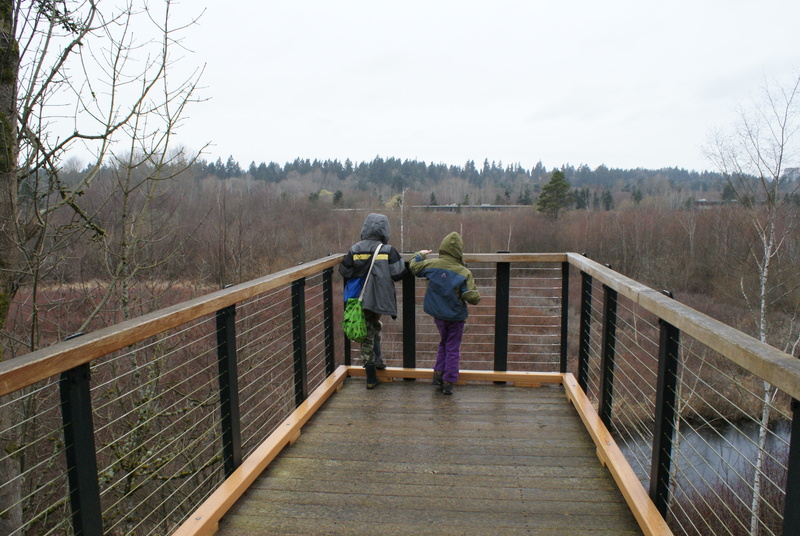 My kids have both been begging to go hiking, and once they were starting to feel better we took a little walk down at Mercer Slough. 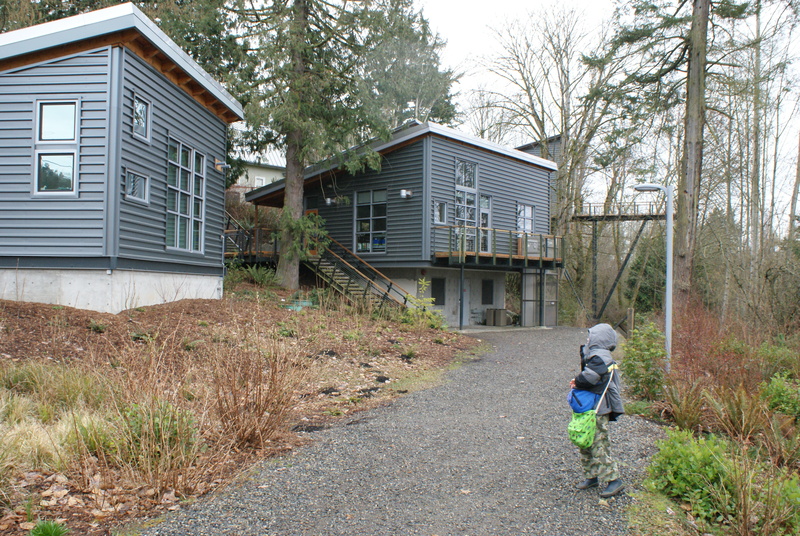 We parked on the east side at the Environmental Learning Center, a newer building that is as beautiful as it is functional. It sits perched above the wetlands, with a panoramic view over the lower land. 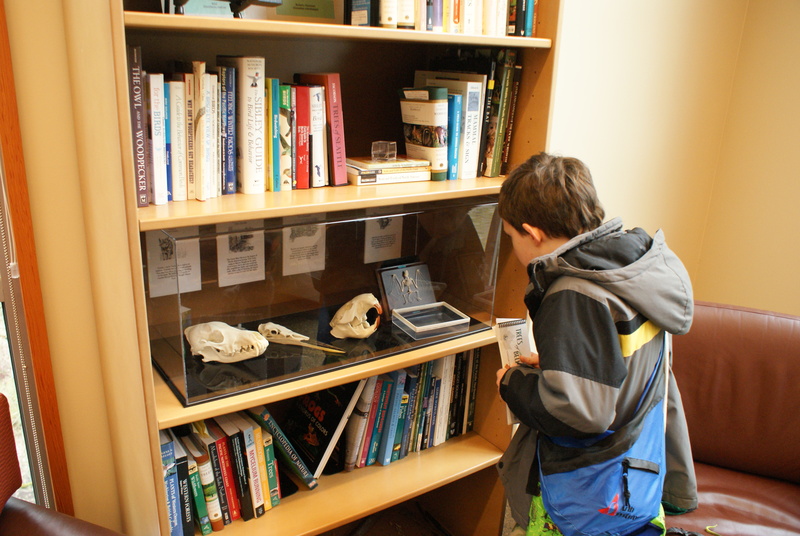 Inside are some fabric panels with interpretive information, some skeleton replicas and natural items to observe and touch. The rangers are friendly and full of knowledge about the park. Kids can pick up a scavenger hunt to do on their walk, or check out a backpack with activities and binoculars to take out on the trails. There are lots of guidebooks you can look at while in the Center, and an art exhibit that changes often. We picked up a map of the trails and a scavenger hunt, and headed south along the road a short distance to the start of the Bellefields Nature Trail. The trail snakes sharply downward into the basin of the wetland. 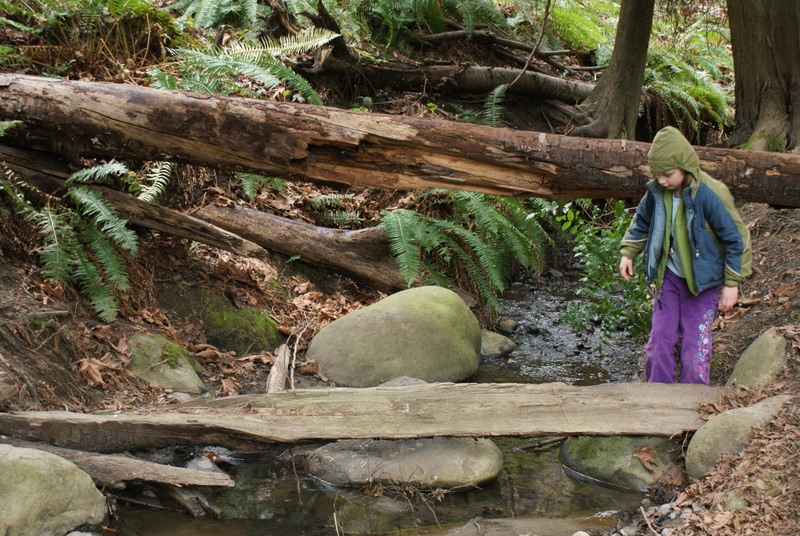 There is a nice little stream that invites children to play and explore, and is a worthy destination on its own. It was here that we discovered that Gabriel’s rubber boots leaked, and here that Annika fell off a rock and soaked one of her pant legs and shoes. 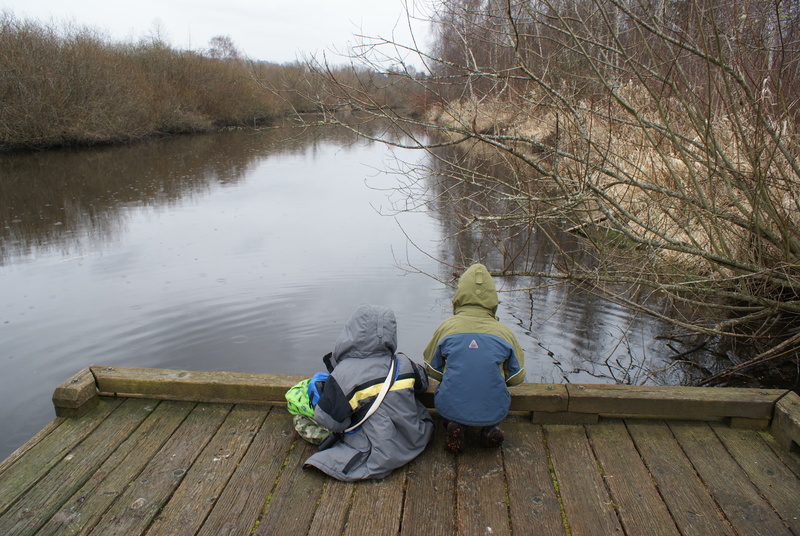 I feared our outing was over before it had hardly begun, but my kids insisted they were fine. We continued walking and soon came to a fork in the path. We decided to head right, beginning the loop in a counterclockwise direction. The forest still looked like winter, but signs of spring were beginning to emerge. 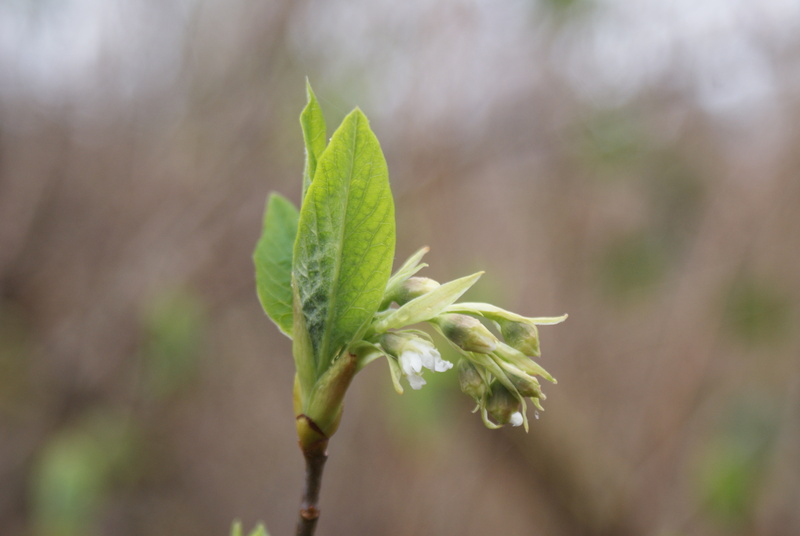 Indian Plum was blooming, our first native shrub to bloom. 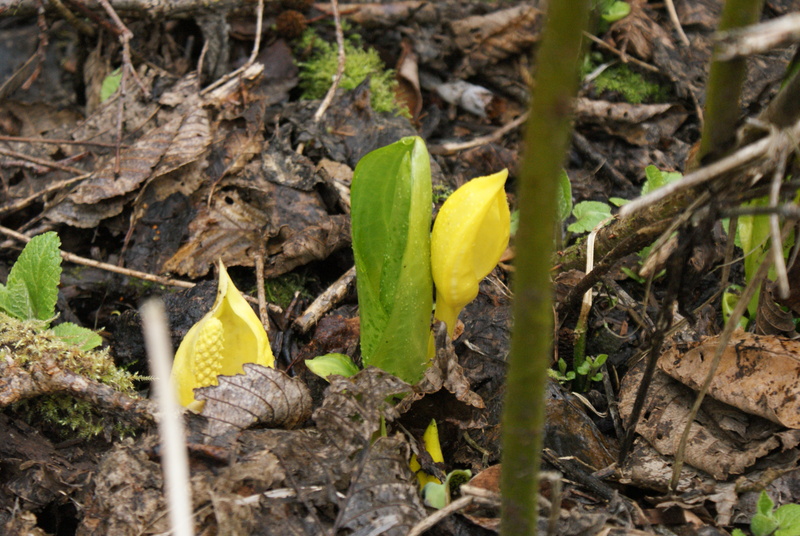 Skunk cabbage were just poking their yellow spathes out of the soggy ground, casting a pungent odor throughout the marsh. We heard bird song and saw a few of our urban birds. We had some sprinkles at times, but we never got too wet. 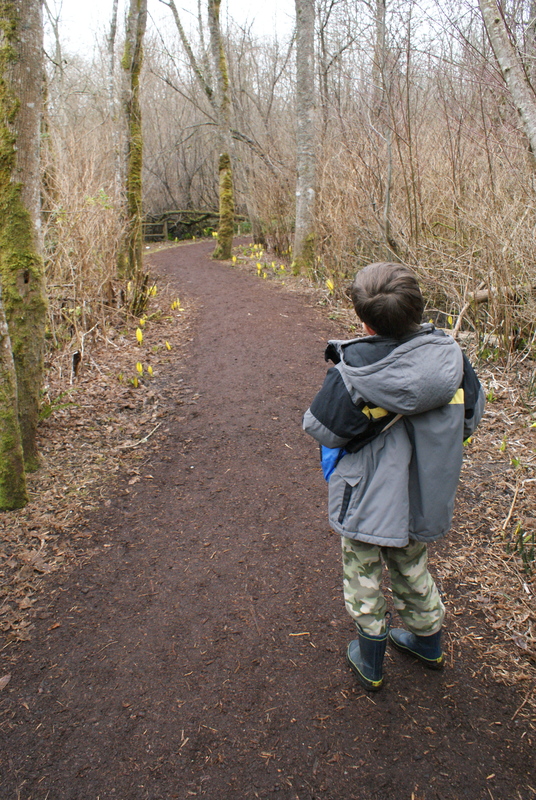 We followed the trail around to the spur that heads out to the open water of the slough. You will be on boardwalks at this point, suspended over the muddy soil. 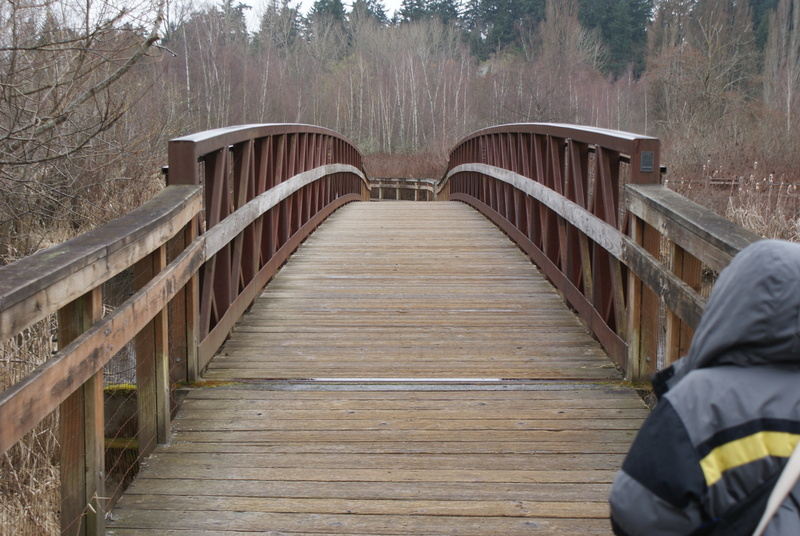 I love the bridge that crosses over the slough, with its curved profile and rusty brown coloring. From the bridge you can look out over the water and see if there are any birds out. We saw buffleheads and mallards, but otherwise it was a pretty quiet bird day. We crossed over the bridge and went down to a little dock that floats on the water. It’s neat for kids to be close to the water and any birds (such as mallards) that are foraging along the shoreline. Annika was getting pretty tired, as she was still getting over her latest cold. We walked back over the slough and continued along the rest of the loop trail, back up the hill to the road, and below the Environmental Center to the car. 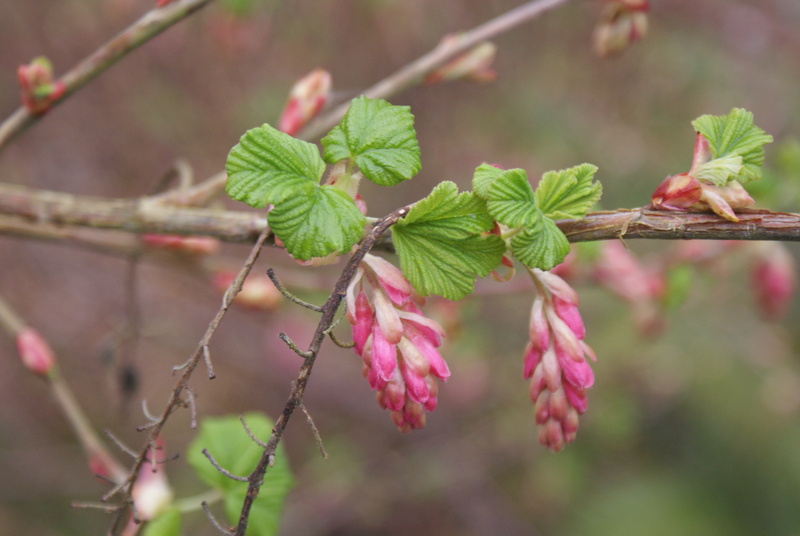 We saw flickers and robins in the trees below the parking lot, and red flowering currents in bloom there, too. I changed Annika out of her wet and muddy clothes, and we made our way home before the worst of the traffic began. This is a good little outing on rainy or cold days, or for when you only have part of the day to explore. You can walk more trails (there are 5 miles of trails in the park) or spend more time exploring areas you are interested in. Toddlers might be satisfied with the short trails around the Environmental Center. It’s also beautiful in the sunshine. It’s an all-season walk in the middle of the city. For directions to the park, as well as hours of the Environmental Center, go to their website.